A frittata can include everything ‘but’ the kitchen sink, as I like to joke. They are the perfect dish to use up bits of leftovers, like potatoes, onions, ham, and small bits of cheese. Savory in every way. We are spending an extra day out on the island this week as yesterday was filled with filming a segment for an upcoming King 5 Evening show. More on that later… The weather has just been exceptional this past week, so a lazy day with all the French doors open is in the cards. Mister Sive has been battling a nasty Summer cold he is getting over, so I see a day filled with reading, naps, and eating! We had guests on Sunday for supper and I made Dungeness crab and corn risotto. We had leftover crab and corn so I thought a frittata would be a fun, filling way to start the day. Frittatas can really be made with a million different combinations of things. I find some sort of cheese always is a welcome addition, and we had some white cheddar on hand. Use a good sized pan/skillet that can go into the oven and in a perfect world is non-stick. Whisk 6 eggs in a bowl after you have added a splash of milk, and a good amount of salt & pepper. On low heat add the egg mixture to a well buttered pan/skillet. Let it cook away until the edges look like they are beginning to set. The middle will still be super uncooked. Add your fillings. Scatter about evenly so each bite you get a bit of everything. Then transfer pan/skillet to the oven under the broiler on high. You want to make sure you have oven mitts or potholders as the handle will get crazy hot. Stay with this the entire time as you will want to turn the pan/skillet as you go as some spots will cook faster than others so just turn as needed. It will puff up and get nice and golden brown. All done! This works great as breakfast with toasted baguette or for lunch or dinner with a green salad and a glass of rosé. A frittata is one of those dishes you can make with just about anything you have in your fridge. I also love them for supper in a pinch. Last eve TPS was away and I whipped this up for a solo meal. We had part of a seeded baguette that was in need of eating before it went stale. A piece of Parm and a head of cauliflower spoke to me as I stood at the refrigerator door. We always have eggs so I knew a meal was soon at hand. Cut up the cauliflower so you are left with small florets. Spread out onto a baking pan, douse with EVOO and a dusting of salt. Into a hot 400 degree oven, shaking the pan every 5 minutes until the cauliflower starts to brown in spots. Take out of oven, set aside. Turn your oven broiler on to heat up while you get the eggs ready. Whisk 2 to 3 eggs in a bowl with a splash of milk. Add salt and pepper. Grate the piece of Parmigiano-Reggiano as well as cube some of it. I like the variety. Then heat up a skillet that can also go into the oven, with a knob of butter. Add the egg mixture. You want the heat on the stovetop to be medium low so the bottom of the eggs cook slowly. When it starts to set, add the cubes of Parm and the cauliflower sprinkling all around the frittata. Then add the grated Parm to the top. Now put whole thing into the oven under the broiler, making sure to watch it the whole time. It is so cool to watch it rise and bubble and cook right in front of you. When it starts to take on a slight brown, it is all done. This can easily be made in a larger pan with more eggs for a larger group. Add a salad if you want to make it a bigger meal. Tasty really any time of the day. 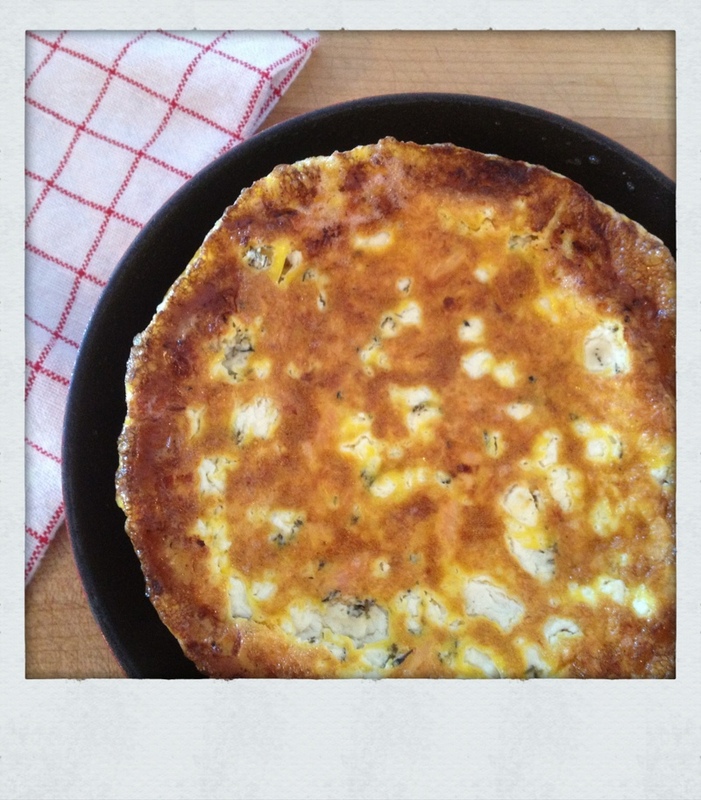 A frittata is one of my favorite things to make and it is quite easy. You can fill it with just about any combo of things you like, and it works for breakfast, lunch or dinner. I almost always serve it with a salad, even for breakfast. We had our niece Aisling visiting from Troy, New York out to the island this week-end along with her sister Haley, who lives in Seattle. I whipped up this version for a late breakfast before we headed back into the city on Monday. You can make these big or small, depending on your skillet size and how many eggs you use. I like to get all the ingredients ready as this comes together quickly so you want the mushrooms sautéed and the cheese cubed or shredded before you begin cooking the eggs. Aisling picked up a beautiful bag of mixed wild mushrooms at the West Seattle Farmers Market that I cooked in butter, after cutting off the better part of the stem. Beecher’s is our neighbor in the Market and I adore their Flagship cheese, so I just cubed up a chunk for this. Non-stick pan is key. Add a good sized knob of butter to the skillet and melt on low. While that is doing that, crack 8 eggs into a bowl, add a splash of whole milk, salt & pepper and whisk away. Add eggs to the buttered pan and keep on fairly low. Cook a bit and then scatter the mushrooms about and then add the small cheese cubes around the mushrooms. While this is cooking away turn on your oven broiler. You only want the eggs to cook enough so the bottom has started to set. The middle will still be quite undone. Once you can lift up the sides of the frittata a bit, it is now ready for the broiler. Here is where you must be diligent. Place the pan under the broiler and do not walk away or do another task. I even leave the oven door open a bit so I can watch it. I turn the skillet every now and then to make sure it is cooking evenly. 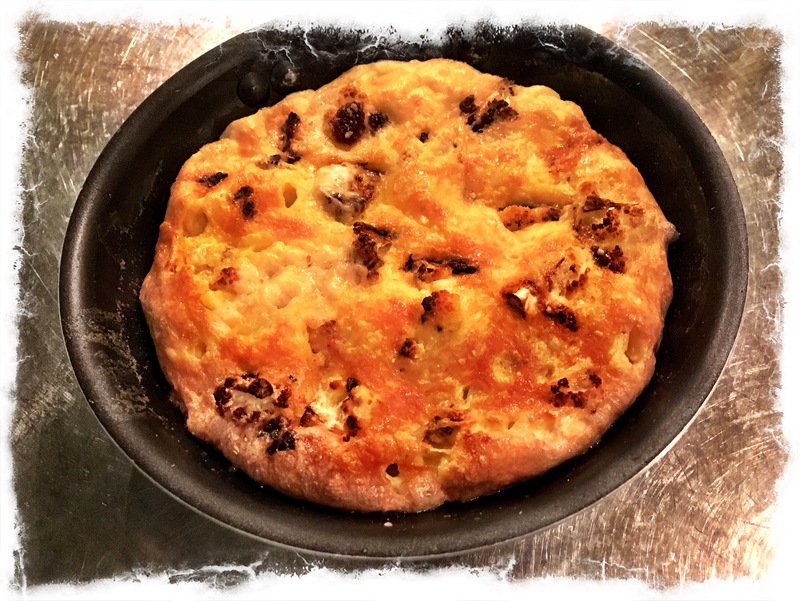 It will puff up and get gloriously brown and the cheese will melt and it will be so good and you will be so proud of yourself because you will feel a tad chef-y. Insert smile. With a potholder carefully pull out of the oven. The handle will also be hot. It will deflate a little, but that is just part of the charm. Slice up, serve with toast or baguette. Enjoy, enjoy. Sunday mornings are a pretty relaxing time at the Watson Sive house. It also most times means eggs of some sort, as the eggs we get at the farm stands on the island are pretty amazing. 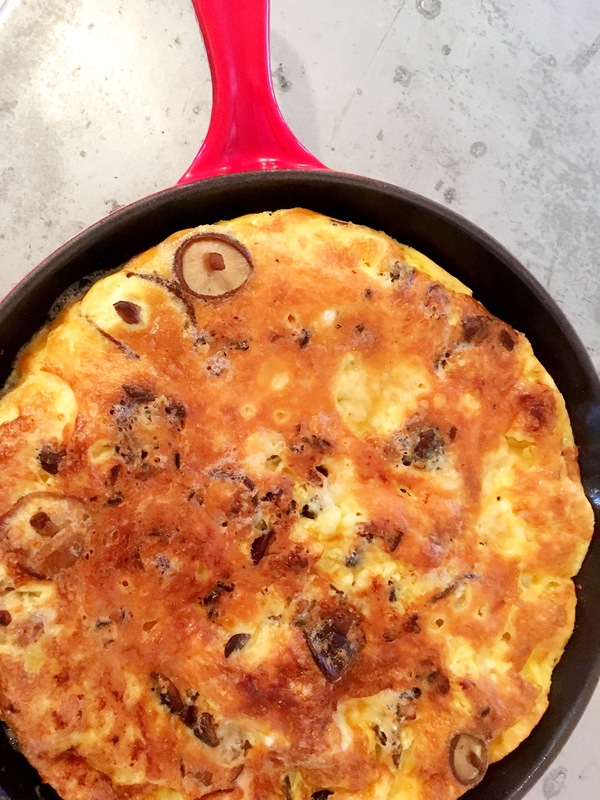 A frittata is one of my ‘go-to’ egg dishes to make, as you can really mix it up by using tons of different ingredients to make a myriad of variations. This has become one of my new favorites. This works perfectly cut in half, serving 2. Break 5 eggs into a bowl, add a splash of milk, a few pinches of salt, a pinch of pepper and whisk together. Turn on broiler in your oven so it begins to heat up. You will want to use a non-stick skillet that can go in the oven for the frittata. Turn heat to the lowest setting on the stove top, and add enough butter so the skillet is fully coated and melts completely. Add the egg mixture to the skillet. Add crumbled bits of smoked salmon and scattered bits of herbed goat cheese around the eggs. Let the eggs cook just until they have set on the bottom, but are still runny on the top. Take the skillet and place under the broiler that you turned on earlier. You want to stay with this dish as it cooks. The eggs will start to bubble, brown, and puff up. Once the entire mixture is set, take out from under the broiler, making sure to wear a heat proof cooking glove or use a hearty pot holder. The handle is going to be quite hot. Serve with toast. This also makes a lovely lunch or Summer supper served with a salad and a glass of Chardonnay. One of the farm stands last week-end had amazing looking eggs. 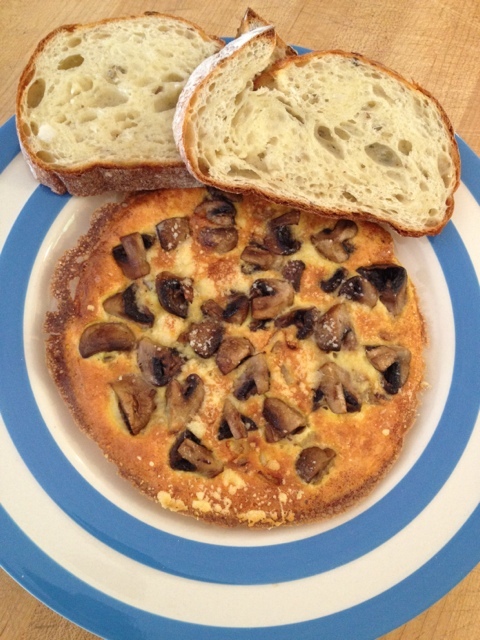 We picked those up, and a quick spin around the grocer for a little inspiration, and a Parmesan and mushroom frittata was on the menu for the next day. Break 2 eggs into a bowl, add a splash of milk, a few pinches of salt, a pinch of pepper and whisk together. Set aside. Cut small white mushrooms in half, add to a pan with a dollop of butter and cook till browned. Set aside. Turn on broiler in your oven so it begins to heat up. You will want to use a non-stick skillet that can go in the oven for the frittata. Turn heat to the lowest setting on the stove top, and add enough butter so the skillet is fully coated and melts completely. Add the egg mixture to the skillet. Add a sprinkling of finely grated Parmesan cheese, then scatter the mushrooms you cooked earlier, then add another dusting of Parmesan to the top of the mushrooms. Let the eggs cook just till they have set on the bottom, but are still runny on the top. Take the skillet and place under the broiler that you turned on earlier. You want to stay with this dish as it cooks. The eggs will start to bubble, brown, and puff up. It really is a beautiful sight to behold. Once the entire mixture is set, take out from under the broiler, making sure to wear a heat proof cooking glove or use a hearty pot holder. The handle is going to be quite hot. Serve with toast. This also works perfectly with a salad and a glass of white wine for lunch or a light supper.